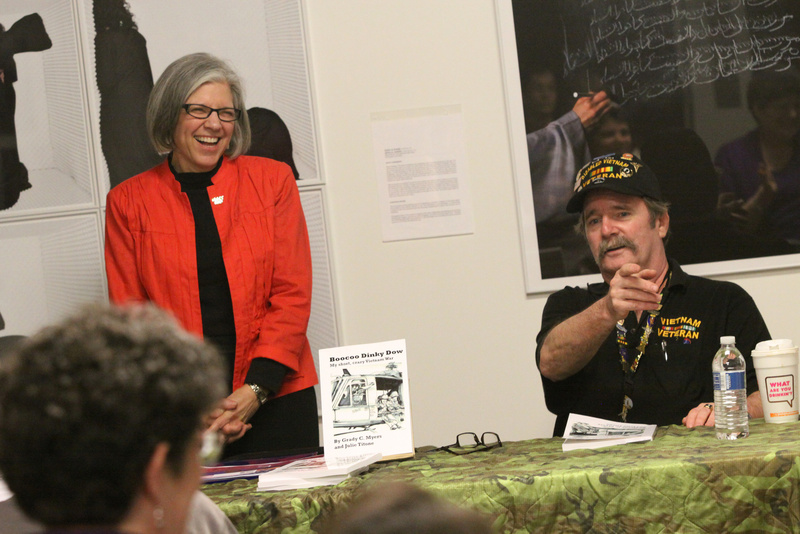 Julie Titone reacts to the stories of veteran Bill Crist, right, at the National Veterans Art Museum in Chicago. Hefting 23 pounds of firepower was one of many surprises I’ve had while sharing “Boocoo Dinky Dow: My short, crazy Vietnam War,” the story of Grady’s U.S. Army life in 1968-69. He was a crackerjack storyteller who used artwork and humor to brighten a dark subject. I co-authored the memoir and published it in 2012, a year after his death. The machine gun episode took place after a book reading at Washington’s Veterans Memorial Museum in Chehalis. Despite my uneasiness with firearms, I had been curious about the M-60, which soldiers called the pig. It’s what Grady humped through the tropical heat and up the mountainsides, what he was firing in the ambush that he barely survived. So when museum staff asked if I’d like to hold one, curiosity won out over discomfort. Good stories like Grady’s are timeless. Still, it can be a challenge to interest people in a book about a war that many don’t remember and others want to forget. One way I do that is to ask if there are any veterans in the family. One 50-something bookstore customer furrowed her brow and answered, “No.” Then her son reminded her that Uncle Bob served in Vietnam. It is how American soldiers heard the French/Vietnamese phrase beaucoup dien cai dau, meaning very crazy. I have done 22 book events in 15 cities since the book was published in June 2012. I was unprepared for my emotional connection to the scores of combat veterans I’ve met. The vets who chat with me after book readings. Who visit my living room. Who post comments on the “Boocoo Dinky Dow” Facebook page. How else to put this? I love these guys. Another surprise: the depth of readers’ curiosity about my relationship with Grady. Why, people wonder, would a woman put so much effort into sharing her ex-husband’s story with the world? I tell them that a writer can’t let a good story go to waste – certainly not a story about a gentle, nearsighted teenager who is transformed into a machine gunner nicknamed Hoss and thrust into an insane conflict on the other side of the world. Body counts, Agent Orange, Zippo raids, napalm, post-traumatic stress and political gamesmanship. All were signatures of the Vietnam “police action” (never officially a war), and I’ve learned a lot more about them in the last year. I’ve seen battlefield photos I’d like to banish from my brain. What I am happy to remember are the many personal stories I’ve gotten in return for sharing Grady’s. They’re like pieces of a puzzle. Put together, they create a picture of war’s trajectory and of its impact on our national psyche. I could fill another book with these stories. That unusually cheerful professor I know? Turns out he’d been a soldier who, after zipping so many buddies into body bags, came home determined to savor each day. Another veteran calls Vietnam the best thing that could have happened to him, because it kept him out of the family business, which was the Mafia. One fellow remembers strangers who, upon seeing his uniform, bought him drinks and meals. Another insists he was spat upon by war protesters. A former protester, still a peace activist, winces at the memory of menacing police dogs. One man did his best to stay out of Vietnam, then spent years wondering what he’d missed. A woman who wrote a friend one week into his tour of duty got the letter back, unopened. He didn’t live to read it. A widow only recently learned her husband had served in Vietnam; she discovered that while going through his papers after his death. A high school dropout from the Bronx carried his platoon’s radio in Vietnam. Its antennae made him a ready target. But he survived his year in-country, earned a doctorate and became a leading authority on English composition. A Chicago fellow got drafted after one year of college and was so traumatized by his war experiences that he couldn’t return to the classroom. His dream of being a history teacher evaporated. A Washington man survived four tours as an Army aerial gunner. He kept re-enlisting because he thought his talent for killing was keeping Americans alive. He returned home unscathed, became a long-distance trucker, then nearly died after a driver pulled in front of him. He married his nurse, raised a family and bought an Illinois tavern. Julie Titone has worked as a Northwest journalist and university communicator. Her writing and photography have appeared in regional, national and international publications.